Mark, who shot this video, and Davin were out for Davin's first bear hunt. 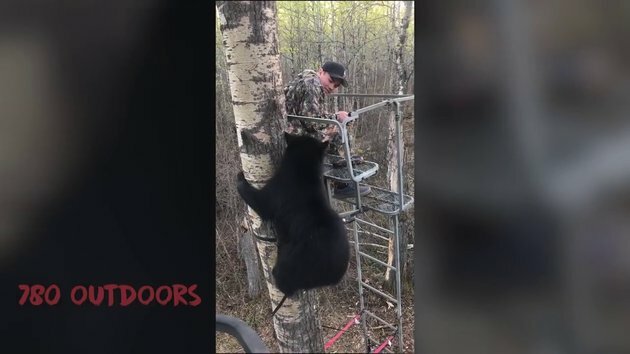 He was sitting in the tree stand when a sow with two cubs worked their way towards the stand. Shortly after, an aggressive boar showed up and chased the cubs. One of the cubs ran up the tree that Davin was set up in! The cub then noticed that Davin was in the stand and decided to take a few looks at him. However, Mark needed to take the bears attention off of Davin while trying not to spook him up the tree any further. He did not want Davin between mama and her cub....Once the cub heard Marks whistles he backed down the tree and back to its mom. It was an intense few moments for everyone involved but they handled the situation tremendously. I'm sure Davin and Mark will never forget this encounter. At the end of the day the cub and its family left unharmed, and so did the hunters. It seems like a nice video and it sure was a close encounter, but they were on a BEAR HUNT! which isn't nice at all. How wonderful to be on your first BEAR HUNT!!!!! Leave the fecking bears alone you bear murderers. Its more natural to hunt bears than writing comments on snotr. Just saying. lol how was this a bear hunt? i do more hunting when i look for sweets in supermarket. If you ever walk in nature and you see a bear cub, you leg it the other direction asap. I'm not even joking. The mother is always nearby and if she spots you... you're screwed.